One of the spots on the racecourse that can provide the most opportunities for gains and losses is the leeward mark rounding. A well planned and well executed rounding puts you going upwind toward the favored side of the course with speed. 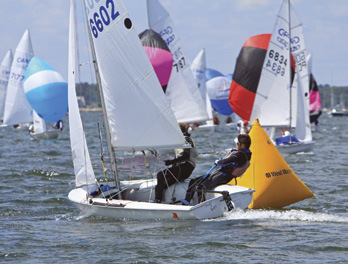 A poorly planned or executed rounding can leave you sailing extra distance in bad air, fighting for a lane upwind. You can make significant gains with a well planned, well executed leeward mark rounding. The mark rounding begins well ahead of the mark – at least ten boatlengths out. If your course features a leeward gate, you might need to think about which gate you prefer early in the run, in order to work toward the inside in clear air on that side of the course. Considerations include which mark is farther upwind, where you will be likely to get inside at the mark, and which side of the beat you will want to work on your way back upwind. Even without a gate, you need to think well ahead, as being inside can be essential to your rounding. As you sail down the run, think about how the traffic is going to condense at the mark. If you’re on a track that will put you on the outside at the mark, take the initiative to get the inside. That might well mean slowing down to go behind a competitor and then work inside. Going behind a competitor on the run is not as painful as it feels, as you can blanket your competition and often establish an inside overlap if you leave yourself enough time. As you approach the mark, if you find that you are going to be outside of several boats, you must act and act decisively. If you round outside of more than one boat, you are sailing substantial extra distance and are likely to end up in bad air with discouraging options to get yourself a clear lane. You will need to slow your boat (be careful not to allow competitors behind to establish an overlap before the zone), allow your competitors to round ahead of you, and round behind them, but on the inside. How do you slow your boat downwind? Overtrim your main, let your jib luff, and slide your weight back. Try it, and watch how frustrated your competitors are when you end up passing all but the inside boat ahead of you. Yes, you’re behind that one inside boat, but you have passed a handful and given yourself the ability to tack out and clear your air whenever you want. The exception to prioritizing the inside at the leeward mark is when you are rounding outside of only one other boat, are confident that you will be able to round with enough speed to stay bow out, and want to work the right side of the beat (or left if you’re rounding a gate to starboard). In that case, round the mark paying particular attention to giving enough room (fouling will ruin your rounding!) and maintaining speed. You will want your speed to be able to punch your bow out ahead of your competitor in order to maintain clear air. If you do a particularly good job, you may even be able to pinch off the inside boat. In addition to tactics, there is a boathandling element to a strong leeward mark rounding. Most sailors have heard the phrase “wide, then tight.” A boat cannot turn on a dime, and will maintain its speed if you turn it more gradually, so begin your rounding wide of the mark, and turn up so that you pass close to the mark as you are settling in to your closehauled course. Easier said than done, right? Take some practice roundings before the race starts. You can also aim for a point one boatlength outside of the mark as you sail down the run – so when you reach that point, you’re already wide of the mark and can then just turn upwind. Also, don’t forget to steer with your weight and sails. Leeward heel will help your boat turn to windward. Trim the main in quickly and allow the jib to be eased, just on the cusp of luffing. In a doublehanded boat, this will require some communication, so again, time spent practicing will pay dividends. How can you practice leeward mark roundings? In practice, instead of finishing a race downwind, finish by having the fleet round the leeward mark. To simulate crowded mark roundings with a small team, you can also run a downwind start to a relatively short leeward mark. And rounding the pin like a leeward mark can become part of your pre-start warmup routine. Good luck! See you on the water! The 2014 Interclub Nationals: A Regatta of Extremes!